So we’ve all seen the jokes about the famous person who only wants one color of M&Ms or skittles which is funny but there are times when you only want one color. Wouldn’t it be great if there was a machine that could sort the colors for you? Well there is, the Skittles Sorting Machine will do the work for you and bonus, you can make it yourself. 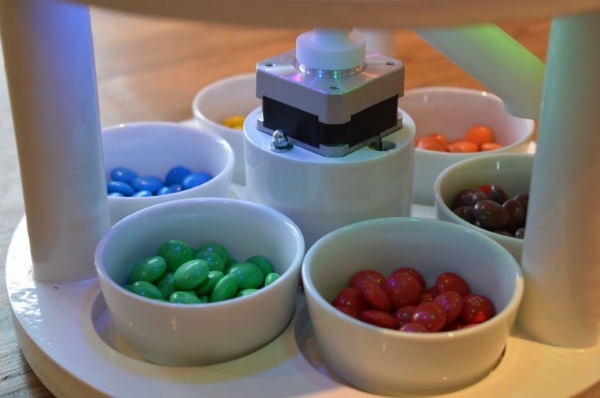 You drop the skittles (or M&Ms) in the top of the machine, the sensor detects the color (which it shows off on an LED strip) before it drops it into the correct sorting cup. It’s all pretty simple, concept wise. The building will take some work though. You’ll have to know a bit about electronics and fabrication to put this together. It’s not exactly a beginner’s DIY project but if you have to have your candies without color mixing, then this is the way to do it. It’s not cheap either, the original maker spent over $500 to get all the components they needed.